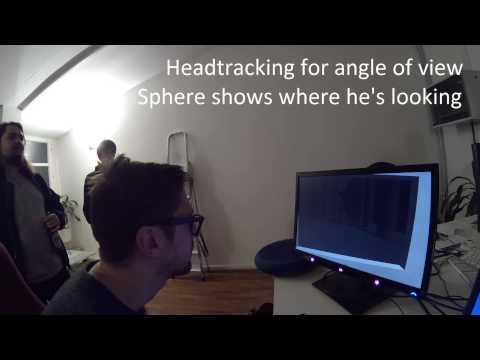 A month ago at the last Berlin Mini Game Jam, I set out to experiment and get acquainted with the Tobii EyeX which can track where your eyes are – and more importantly, where exactly you look on the screen. The obvious thing would be to use that gaze tracking, but out of ideas and inspired by Amazon Fire Dynamic Perspective, I tried to use the actual eye tracking to make the monitor behave like a window into a real-life scene. My goal was to create the illusion of actual 3D, but maybe due to my scene not being very exciting that turned out rather boring. It looked a bit more interesting once I dropped the “real-life window” idea and made it more a “choose your perspective with head movement” control by exaggerating the movement. By then, I had only half an hour left and no gameplay, so I did the obvious: I added polka and bouncing balls that shoot where you look! Maybe it could have been an interesting horror game with good assets and actual gameplay – although for an immersive perspective horror game, I would probably rather use an Oculus Rift. The new technology must be used for a part of the core gameplay. The benefits (e.g. immersion, precision, ease of use, unique aspects) of using the new technology over traditional technology must outweigh the disadvantages for the intended purpose. Eye trackers seems to be more suited for passive or highly situative supporting roles – targeting, for example, seems to be easier and more precisely done with a joystick or a mouse for most purposes. But by now, I have a really cool idea that I want to experiment with next time. Can’t wait until I get a new laptop with USB3 so I can try my hand at eye tracking again!